Experts in group ferry travel AFerryGroups picks ten of the best crossings to ensure your next group holiday is plain sailing. Calais is the gateway to northern France and a popular haunt for groups wanting to experience either the war graves of the Nord Pas de Calais or Picardy, the excellent shopping of the city of Lille, or for those who want to travel further south towards Paris. This is the easy access route to the picturesque town of Bruges, perennially popular for groups of all ages. It’s also a hop off point for the coastal town of Ostend, which is renowned for its beaches and seaside atmosphere. This route sets you up to visit the coast of Brittany, the megaliths, the gaufres waffles, and the famous Mont St.Michel, with recently updated and improved access to make it even more delightful. Next to Le Tréport (recently seen in Witnesses on the TV) Dieppe is also one of the best portals into Normandy, with its gardens, cider and, of course, Giverny, aka Claude Monet’s garden. This is the access point to the bulb fields and the fascinating city of Amsterdam. Alternatively you can travel further afield from here, into northern Germany, the Rhine and Cologne. This route serves up the delights of County Wicklow and the city of Dublin – home of Guinness – or it’s the place to go for a golf weekend for groups looking for some of the best courses in Europe. Now known as a party destination, Belfast is top of the hen and stag circuit, but maybe a sightseeing trip to the Giant’s Causeway is more up your street. Bilbao is thegateway to the Basque Country with its distinctive cuisine. It’s also home of Guernica and the portal to the Pyrénées for skiers, walkers and hikers. Plus, it’s a good option for groups wanting to experience the running of the bulls in Pamplona. With Continental flavour, a mild climate and easy going tranquillity, the Channel Islands are always a favourite for those looking for a quieter pace of life. Fishbourne opens up the Isle of Wight Festival with Osbourne House for the history buffs or Cowes for the sailors. It’s quick and easy to get to, and they speak the same language. AFerryGroups books group ferry travel for parties of ten and above. Its team of dedicated travel consultants can customise travel plans within a range of more than 250 routes. Call 0844 576 8845 for more information or visit www.aferrygroups.co.uk. 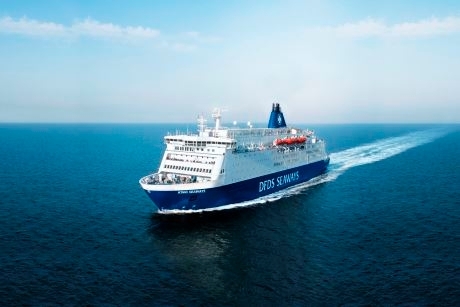 Ferry operator DFDS is offering groups and coach operators a tailored group deal on its Newcastle to Amsterdam route. Cruise passengers arriving at Portsmouth International Port will soon be able to sail straight to the heart of the waterfront, on a new free boat service. Cruising company Swan Hellenic has launched its 2017/18 winter brochure with details of its selection of cruises running from October 2017.